The Honda Clarity fuel-cell hatchback is now available in the United States, but not in Canada. Honda is expanding its portfolio of electrified and alternative-fuel vehicles by bringing the Clarity Plug-In Hybrid to Canada and announcing Jan. 19 a new dedicated hybrid vehicle, yet to be named. The automaker’s only electrified vehicle available now is the Accord Hybrid. The company said in July 2016 it would end production of the CR-Z hybrid, citing slow sales. The Clarity will be on sale in late 2017 but pricing has yet to be announced. The second hybrid will be made in North America and launched nationwide in 2018. Honda also said Jan. 19 it will bring its alternative-fuel powertrains to its line of light trucks in the future, although it didn’t offer a specific timeline. Earlier in January at the 2017 North American International Auto Show in Detroit, Mich., Honda’s global CEO Takahiro Hachigo said that half of the new models that Honda will launch in the United States in the next two years will be electrified. “In the long term, electrified vehicles are key to the future of carbon-free mobility,” he said. Honda has set a global target for two-thirds of all sales to come from electrified models by 2030. By 2050, it wants to cut carbon-dioxide emissions in half from year 2000 levels. The announcement of the Clarity follows a pattern first set by Toyota, which ultimately filled out the Prius nameplate with three variants: the Prius v wagon; the smaller Prius c; and a plug-in version of the standard Prius. It’s also a strategy similarly used by Hyundai, which plans to roll out the Ioniq compact hatchback in hybrid, electric and plug-in hybrid formats in Canada. 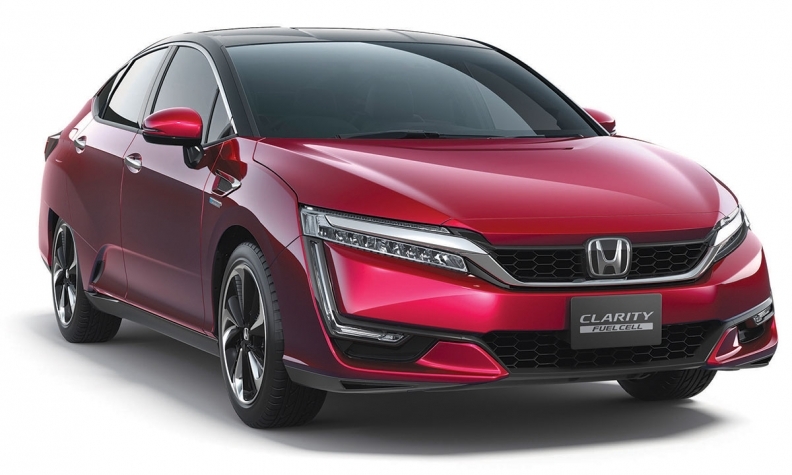 Honda plans to eventually offer the Clarity with three different powertrains: hydrogen fuel-cell; plug-in hybrid; and battery-electric. Hyundai plans to make only the plug-in available in Canada. The fuel-cell hatchback is now available in the United States while the battery-electric version will soon be on sale. Honda was the first automaker to sell a hybrid vehicle in North America when it launched the two-seat hatchback Insight in 1999. In 2000, the Toyota Prius arrived. Honda stopped production of the Insight in 2006 after years of poor sales while the Prius went on to become by the dominant hybrid in the market today. Honda’s new hybrid that’s scheduled for launch in 2018 will use the system found in the current Accord Hybrid, the company said. Depending on conditions, the vehicle is powered by either an electric propulsion motor — usually during city driving — or the gasoline engine at high-speed cruising. The new model announced Jan. 19 will be produced at an existing plant in the United States, but the company didn’t specify which. Additional details on the vehicle and its manufacture will be announced closer to its launch.